Radicular or apical periodontal cyst is an inflammatory odontogenic cyst that develops in the periapical region of a non vital tooth. The source of epithelium is cell rests of malassez and the proliferation is usually stimulated by inflammation. The cyst consists of fibrous connective tissue wall lined by epithelium with a lumen containing fluid and cellular debris. Most periapical cysts grow slowly and do not attain large size. Occasionally similar cyst named lateral periodontal cyst may appear along the lateral aspect of the root. The most common etiology is any infected tooth which leads to necrosis of pulp. Like periapical cyst, this cyst also develops from epithelium of cell rests of malassez. The source of inflammation of these cysts is mostly from periodontal disease or pulpal necrosis with spread through lateral foramen. Coming back to the radicular cyst, the patient with radicular cyst will have no symptoms unless there is any acute inflammatory exacerbation. Mild sensitivity and swelling may be seen as the cyst grows larger in size. Movement and mobility of adjacent teeth are seen as the cyst enlarges. These cysts are also known to be associated with deciduous teeth. The cyst is lined by stratified squamous non keratinized epithelium of variable thickness. Epithelium shows spongiosis and inflammatory cell infiltration. Cystic lumen is filled with fluid containing cholesterol crystals and protein that stains palely eosinophilic. RUSHTON’S BODIES- linear or arch shaped hyaline bodies with variable staining of uncertain origin and unknown significance, but probably of heamatogenous origin, found within lining epithelium. These are found in the epithelium of apical, periodontal or residual cysts. Dystrophic calcification, cholesterol clefts with multinucleated giant cells, red blood cells, and areas of hemosedirin pigmentation may be present in the lumen, wall, or both. Connective tissue capsule adjacent to lining epithelium is delicate with dense inflammatory infiltrate containing most commonly, lymphocytes along with small numbers of neutrophills, plasma cells, histocytes, and rarely mast cells and eosinophills. The connective tissue capsule may also show cleft like spaces filled with cholesterol that are spindle shaped spaces. 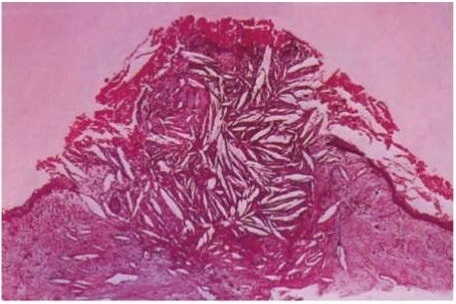 The presence of these cholesterol crystals evoke a granulomatous reaction in the connective tissue. Deeper portion of connective tissue capsule is more fibrous with relatively less inflammation. Non-keratinized lining epithelium of variable thickness. Dense inflammation of cystic capsule. Treatment of radicular cysts mostly involves removal of the tooth responsible with the curettage of the periapical tissue. In cases where the cyst is small in size, root canal therapy can be performed followed by Apicoectomy of the cystic lesion. Recurrence of the Cyst in the form of a Residual Cyst occurs when any epithelial remnants are left behind from the cystic sac and in case of incompletely removed epithelial rests. The recurrence is seen sometimes months or even years after the treatment has been done.